Splish! Splash! Sploosh! The adorable stars of Bears on Chairs and Bears in Beds are back, and they’re ready for bath time. Or are they? Water, soap, and sponge are there. The bath is ready. Where are the bears? The four little bears are grimy, dirty, and covered in mud! But when they see the bath and Big Brown Bear ready to scrub, they back away. "We don’t want a bath," they say. Will those grungy bears ever get in the tub? Whether bath time’s a favorite time of day or a fraught one, this fun-to-read rhyming story and the silly antics of impossibly cute bears will make a splash with toddlers and parents alike. Shirley Parenteau is the author of two other books about the bears as well One Frog Sang, illustrated by Cynthia Jabar. She says, "Getting grubby bears into the tub isn’t easy, but it’s fun!" Shirley Parenteau lives in Elk Grove, California. David Walker has illustrated many children’s books, including the two previous bears books and Peep and Ducky by David Martin. He says, "What could be better than a bunch of bouncing baby bears in bubbles?" David Walker lives in Chapel Hill, North Carolina. With large font and short phrases, each easy-to-read four-line stanza moves the story forward to its splashy conclusion. Children will be amused by the bouncy rhymes, which are easy for toddlers to grasp and eventually memorize. It’s nice to read strong verbs like smudge, trudge, scoop, wriggle and giggle in a book for toddlers, helping them build their vocabulary and adding interest for the adults who will no doubt read this many times. Splish! Splash! Everyone will look forward to a bath. The rhyming text is sing-songy and smooth... The subdued acrylic hues of the salmon pink, sky blue, soft yellow, tan, and light brown bears–and their resemblance to the kinds of simple, fuzzy bears used to decorate nurseries–create a childlike feel. The ample white space surrounding the bears allows children to focus on the cuddly critters. This is a sweet story for children to share with their grown-ups before bed or bath time. This charming book will entice young children with its bright palette and energetic narrative. Parenteau’s rhymes flow smoothly and employ an impressive array of synonyms to describe the young bears’ lack of cleanliness. The sketchy illustrations are loose but uncluttered, nicely capturing the simple joys of bath time with their vibrant colors. A sweet addition to the bath-time genre. 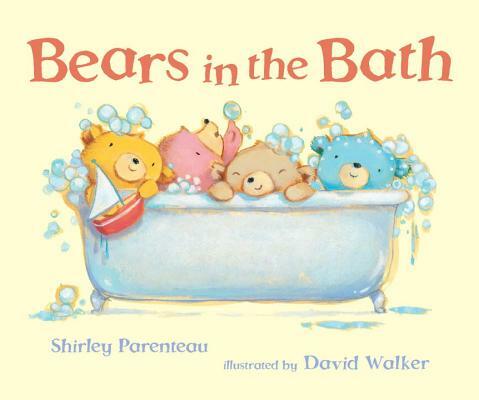 Walker’s acrylic paintings make the bears as adorable and personable as ever, and Parenteau’s peppy descriptions of their in-the-tub antics (“They toss the bubbles./ They giggle and shriek”) may persuade a few reluctant bathers to dive in. Big Brown Bear wants to entice four "grimy" but stubborn cubs into the bath, and finds a wonderful way to accomplish his mission in this fresh twist on bathtime tales. ... David Walker uses acrylics like pastels, as he depicts an irresistible parade of toddler stand-ins tracking muddy paw prints hither and yon. ... Guaranteed to break down resistance to bathtime.